Sandra Sermone refused to wait. She had seen her son Tony through heart surgery, a feeding tube, countless blood tests, brain scans, and medical appointments. This little boy who struggled to eat, talk, and play had begun to get worse. All his doctors could tell her is that his laundry list of problems – including severe developmental delays, poor vision, and autism – were probably caused by a genetic defect. They didn't know which one: all the usual tests had come back normal. "Everyone said to 'wait and see.' They didn't push for any major therapies. I think they thought he was going to die," she said. Sandra had three things: a telephone, a computer, and an inability to be discouraged. She would find an answer for what was happening to her child. She placed hundreds of calls to hospitals and research centers, looking for a medical study that would take him. Finally, she got Tony accepted into an "Undiagnosed Genetic Syndrome" study at Duke University in North Carolina, a long plane ride from their home in Washington state. At Duke, Tony underwent whole exome sequencing, a new blood test that looks for defects in all the genes that encode proteins in the human body. Within months, the researchers told her they found something quite rare. Tony had a defect in his ADNP gene. The six-year-old was among the first dozen people in the world to be diagnosed with ADNP (Helsmoortel-Van Der Aa) Syndrome. But that is not the end of Tony's and Sandra's story. In fact, it was just the beginning. What Sandra would do next would set the stage for so much more. Sometimes mothers just know. Sandra sensed something was not quite right when she was seven months pregnant with Tony and his fraternal twin, Rocco. One twin didn't move as much as the other. When the boys were born in early 2008, she also had a gnawing feeling about Tony. He looked different than Rocco and their older sister in a way that seemed to mean something. At the time, the doctors told her not to worry so much. So did friends and family. Was she just an anxious mom with post-pregnancy hormones? Unfortunately, no. Within a few weeks of the twins’ births, she learned that Tony had multiple heart defects and other physical abnormalities. (Rocco was fine.) Doctors began testing Tony for an array of genetic syndromes most parents have never heard of: DiGeorge, Smith-Lemli-Opitz, Angelman, Noonan, Prader-Willi, and Sotos. All those tests came back negative, but still his list of problems grew. He had delays in walking and talking, cortical vision impairment (a vision problem based in the brain, not the eyes), autism spectrum disorder (ASD), gastroesophageal reflux disease, excess fluid in the brain, low muscle tone, and difficulty swallowing and eating, among other concerns. So when the specialists at Duke handed her a piece of paper that said ADNP mutation, it gave her a reason, but not necessarily the reason, for his long list of medical conditions. "They told me that ADNP is associated with some of Tony's conditions, but Tony is way more complicated, so he probably has something else, too," she recalled. With only a handful of known cases, no one had cataloged all the symptoms of ADNP mutations – or all the people with this genetic error. When she got back from Duke, her first order of business: find out more about ADNP, or Activity-Dependent Neuroprotective Protein. 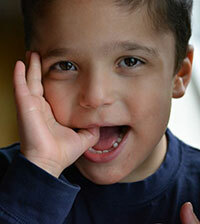 What would this mutation – a change to a single gene on chromosome 20 – mean for Tony's future? "There was very little information on this syndrome, and I had a massively complicated kiddo who didn't fit the bill," she says, matter-of-factly. Where she once worked the phones to find a research study, now she worked the computer to extend her search for answers across the Atlantic Ocean. Researchers at University of Antwerp in Belgium had recently linked ADNP mutations to 10 cases of autism.3 Besides autism, many of those people shared similar diagnoses, including intellectual disability, feeding problems in infancy, low muscle tone, and speech delay. They also shared similar facial features: a prominent forehead, high hairline, broad bridge of the nose, and a thin upper lip. Sandra remembered her concern that Tony's features seemed a bit different at birth. She emailed those researchers. She wanted to help them with their work, and she wanted to find other parents of children with this mutation. Frank Kooy, professor of cognitive genetics at University of Antwerp, recalled meeting Mrs. Sermone online. "We were pleasantly surprised by being contacted by the mother of an ADNP kid from over the Atlantic," he said by email. The Belgians knew of a few other families in the United States, and agreed to pass along her contact information to those patients’ physician. Parents of newly-diagnosed children – whatever the diagnosis – often find comfort in meeting others who are traveling their path. Soon Sandra was on the phone with those parents, swapping information. She began to suspect that the complicated web of symptoms Tony experienced had only one cause. "These ADNP kids were almost identical, physically and developmentally, and much more medically complex than what was known," she said. That gave her an idea. She became, in her own words, a "crazy obsessed, highly caffeinated, middle of the night, internet stalking, Mommy-Detective." She began emailing and speaking with top researchers on three continents – and collecting information on her own. In a way, Sandra Bedrosian Sermone became the embodiment of what happens when patients and researchers work together. The research community calls this "patient-powered research," and hopes it will both speed up discovery and focus on questions important to patients. But Sandra didn't know where her sleuthing would lead in 2014. She just wanted to find other families like hers. So she created a Facebook page dedicated to ADNP. The University of Antwerp helped by posting a link to her webpage on its website. Within a month, she found 10 families. Five months after that, she created a questionnaire asking each family about their child's growth, development, and medical history, intrigued by the similarities they shared. Does your child have a heart defect? Did she aspirate or gag a lot as a baby? When did he get his first teeth? 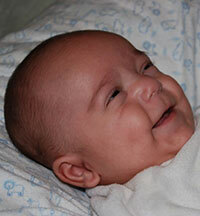 (Tony's baby teeth came in unusually early, long before his twin's.) Does he speak? What therapies and medications does she get? And so on. She began collecting the answers on Excel spreadsheets. She's not a scientist – she's a high school graduate and former office manager – but she began conducting research like one. She reached more families, over 100 children and adults in North and South America, Europe, Australia, and the Middle East, as of early 2017. She assembled her spreadsheets on a wall of her home, with photos of each person, like you would find on a detective show. "She's doing what a clinical geneticist might do," said Raphael Bernier PhD, an autism researcher at University of Washington who is familiar with her efforts. Families were eager to help. Some of their children had been in medical limbo for longer than Tony, shuttling between doctors who could not put a name to their condition or tell them what kind of future to expect. Mrs. Sermone is cheerful, funny, and friendly; it's not hard to understand why strangers would spend an hour or more sharing intimate details of their children's lives with her. They didn't have to wait for her results, either. They could visit a website she created, ADNPkids.com, to see what she was learning from them. One thing Mrs. Sermone found is that more than 80 percent of people with an ADNP mutation have been diagnosed with autism. Most of the ones who haven't been diagnosed, probably should have been, she said. People with ADNP have a somewhat narrower set of autism symptoms that could confuse some diagnosticians, she believes. That happened to Tony, and she says other families have told her strikingly similar tales. At first, doctors thought Tony was too social and connected to parents to have autism. But he had other ASD symptoms: severe speech delay, repetitive motions such as flapping his hands, and poor play skills. Also, he ignored other children, including twin Rocco and sister Sophia. Mrs. Sermone wishes he were diagnosed sooner, so he could have begun Applied Behavioral Analysis, an autism therapy, when he was ages two or three, instead of later. Behavioral therapy has been very helpful for Tony, she said. Tony's autism spectrum diagnosis was confirmed at the University of Washington, where he participated in the TIGER (The Investigation of Genetic Exome Research) study. There she met Dr. Bernier, an investigator in the Simons Simplex Collection autism project. Dr. Bernier and others discovered several rare gene mutations in a handful of the SSC children, including two with an ADNP defect.4,5 "ADNP plays a huge role in brain development, but it also regulates and controls the operation of other genes," Dr. Bernier explained. Another mutation, CHD8 was the focus of earlier papers, but now ADNP is edging its way up the research agenda. Mrs. Sermone may have something to do with that. 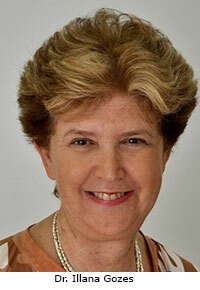 The story of ADNP began more than 15 years ago, in a lab in Israel.6,7 Dr. Illana Gozes, a professor of clinical biochemistry at Tel Aviv University, discovered ADNP and its vital role in brain development, learning and memory while searching for genes and proteins that protect nerve cells. Her lab has studied the role of ADNP in brain-based disorders such as Alzheimer's and schizophrenia. ADNP influences the work of many other genes, like a master switch of sorts.8-10 Dr. Gozes' research team thought ADNP might play a role in autism.11,12,13 "When we discovered that without ADNP, the brain does not form, and when we saw that ADNP-deficient mice are socially impaired, we suggested a connection to autism," Dr. Gozes recalled in an email to IAN. Besides Dr. Gozes in Israel and Dr. Kooy's team in Belgium, she began talking to researchers much closer to her home, in a small town in Washington state. In 2015, she called the genetics office at Oregon Health and Science University (OHSU), across the Columbia River in Portland. 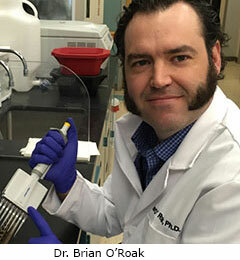 She reached assistant professor Brian J. O'Roak, PhD. "She had no idea I was involved in the discovery of ADNP and its relation to autism," he recalled. Soon she met with him and Eric J. Fombonne, the prominent French psychiatrist and autism expert, at OHSU. Mrs. Sermone explained that she had created her own ADNP registry of sorts. She wanted a university or research center to take on the data collection, coordinate research, and provide medical help to families affected by ADNP. As a geneticist, Dr. O'Roak said, it's not unusual to be contacted by the parent of a child with a rare mutation. "But it is uncommon to be contacted by a parent who is this involved and really pushing for the science to happen. She's definitely an outlier in that respect," he said of Mrs. Sermone. "A lot of things need to happen between the discovery of a genetic mutation, and the development of treatments or interventions for it," he said. "Having families who are organized and motivated to participate in research is very helpful." Initially, ADNP was not at the top of his list of genetic changes to research for autism, Dr. O'Roak said. After meeting with Mrs. Sermone, he realized that a well-organized parent group like hers could be a starting point for developing new ways for understanding the genetics of autism. "The work they've done has made it tangible to think about having a more immediate impact by starting with ADNP. By working with ADNP kids we hope to build a framework for targeted interventions that can be broadly applied to the many rare genetic causes of autism in the near future." Some researchers said it's possible that several thousand people have ADNP Syndrome, which is not inherited. But as long as it's relatively unknown, and there is no quick and inexpensive blood test for the mutation, it is hard to say. By looking at ADNP, scientists hope to develop a framework for researching different genetic mutations linked to autism. What common thread binds them all to the collection of behaviors we describe as autism? "We want to study some of those mutations and learn about what's happening at a deep level in the human clinical presentation, and get at the neurobiology of it. We want to take what they've done to the next level," Dr. O'Roak said. OHSU recently applied for a grant to establish a National Institutes of Health Autism Center of Excellence, as have other universities across the United States. The center would include two projects to investigate ADNP syndrome and begin modeling the mutations in different systems. Mrs. Sermone has submitted letters of support for ADNP research on behalf of her parent group, the ADNP Kids Research Foundation, which she incorporated in 2016. Dr. Bernier said University of Washington is also interested in similar work on ADNP and other genetic mutations in autism. What is it like for Sandra Sermone, as a parent and lay person, to meet with some of the best scientific minds in the world of autism genetics? "It's not intimidating," she volunteers. "At first, it was desperation. There was so little known about ADNP. I just wanted to reach out and say, 'What do you need from me? I want to be part of your research.'" After contacting a researcher, for instance, she would send him or her a disc with Tony's medical records for them to use. "I'm not the most eloquently spoken person, and I try to cover up worry with humor, but I'm very passionate about these children," Mrs. Sermone said. "I am quite a talker, and once I get going, I get very excited about sharing the information I've learned about ADNP." She chuckles: "These doctors get a kick out of me, I think." When you have a child with an obscure syndrome, one that may be too rare to attract research funding, you want to do whatever you can to find help, she explains. "I'm a true believer that researchers could accomplish 100 percent more if they involved parents because we see everything about our children. There is still so much about this gene we don’t know," she said. Besides TIGER and Duke, she has joined other research projects, including the Interactive Autism Network at Kennedy Krieger Institute, the Simons Variation in Individuals Project, and SPARK, part of the Simons Foundation Autism Research Initiative. Science can offer practical solutions to families, she said. If researchers can prove that certain treatments work, or that a gene mutation causes certain conditions, then doctors can order the right tests and treatments, and insurance companies will cover them, she said. In the course of her research, she found that "ADNP kids" who received a certain kind of speech therapy were much more likely to speak than those who did not. One version of this therapy is called PROMPT, or Prompts for Restructuring Oral Muscular Phonetic Targets, and it focuses on the muscles of the mouth. She realized that Tony could not move his tongue around his mouth purposefully, which made it hard for him to talk. When her insurance would not cover PROMPT therapy, she began to do it on her own, and Tony's speech grew. If scientists can prove it works for children with ADNP, then oral-motor therapy will likely become more available, she said. Research takes time and money. Meanwhile, she fields calls from around the world from parents seeking help. "I had someone from Brazil call me recently," she said. "He was so frustrated because his daughter seems to have cortical vision impairment but the doctor won't consider the diagnosis or refer her to a specialist because she can walk." Another family contacted her because their child has severe sleep problems but has never been referred to a sleep specialist. She tries to help with advice or research, or just a sympathetic ear. "I stalk the internet at night. I have piles and piles of research I've printed out." Tony, like a number of children with the mutation, doesn't always sleep well, so neither does his mom. But in typical fashion, she looks on the bright side of her sleeplessness. "I get a lot of my work done in the middle of the night. It's very lucky for me that my husband works for a coffee company," she says. IAN Member Discovers Early Warning Sign for Autism Syndrome: Mrs. Sermone, Dr. Gozes, Dr. Kooy and colleagues publish their findings in Translational Psychiatry. The Simons Foundation Autism Research Initiative publishes the Simons VIP Connect page about ADNP. Simons also funds the SPARK for Autism research project. Patient-Powered Research Networks, which include the Interactive Autism Network, are initiatives of the Patient-Centered Outcomes Research Institute under the U.S. Affordable Care Act. Photo credits: Sermone family members/Sandra Sermone, Dr. Illana Gozes/Dr. Gozes and Tel Aviv University, Dr. Brian O'Roak/Dr. O'Roak and OHSU. Gozes I, Helsmoortel C, Vandeweyer G, Van der Aa N, Kooy F, Sermone SB. 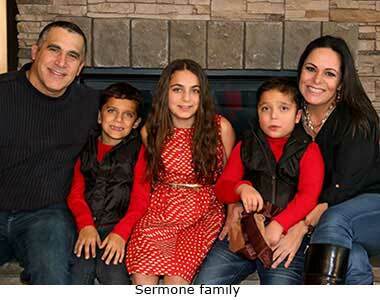 The compassionate side of neuroscience: Tony sermone's undiagnosed genetic journey--ADNP mutation. J Mol Neurosci. 2015;56(4):751-757. 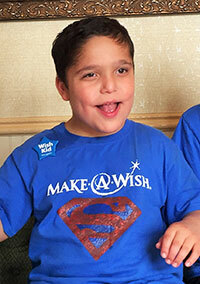 Sermone S. Why my son with ADNP syndrome is just like superman. https://themighty.com/2016/10/parenting-a-child-with-adnp-syndrome-what-to-know/. Updated 2016. Accessed December 15, 2016. Helsmoortel C, Vulto-van Silfhout AT, Coe BP, et al. A SWI/SNF-related autism syndrome caused by de novo mutations in ADNP. Nat Genet. 2014;46(4):380-384. Abstract. O'Roak BJ, Vives L, Girirajan S, et al. Sporadic autism exomes reveal a highly interconnected protein network of de novo mutations. Nature. 2012;485(7397):246-250. Abstract. O'Roak BJ, Vives L, Fu W, et al. Multiplex targeted sequencing identifies recurrently mutated genes in autism spectrum disorders. Science (New York, N.Y.). 2012;338(6114):1619-1622. Abstract. Bassan M, Zamostiano R, Davidson A, et al. Complete sequence of a novel protein containing a femtomolar-activity-dependent neuroprotective peptide. J Neurochem. 1999;72(3):1283-1293. Abstract. Zamostiano R, Pinhasov A, Gelber E, et al. Cloning and characterization of the human activity-dependent neuroprotective protein. J Biol Chem. 2001;276(1):708-714. Abstract. Mandel S, Gozes I. Activity-dependent neuroprotective protein constitutes a novel element in the SWI/SNF chromatin remodeling complex. J Biol Chem. 2007;282(47):34448-34456. Abstract. Ivashko-Pachima Y, Sayas CL, Malishkevich A, Gozes I. ADNP/NAP dramatically increase microtubule end-binding protein-tau interaction: A novel avenue for protection against tauopathy. Mol Psychiatry. 2017 Jan 24. doi: 10.1038/mp.2016.255. Abstract. Amram N, Hacohen-Kleiman G, Sragovich S, et al. Sexual divergence in microtubule function: The novel intranasal microtubule targeting SKIP normalizes axonal transport and enhances memory. Mol Psychiatry. 2016;21(10):1467-1476. Abstract. Malishkevich A, Amram N, Hacohen-Kleiman G, Magen I, Giladi E, Gozes I. Activity-dependent neuroprotective protein (ADNP) exhibits striking sexual dichotomy impacting on autistic and Alzheimer's pathologies. Transl Psychiatry. 2015;5:e501. Abstract. Pinhasov A, Mandel S, Torchinsky A, et al. Activity-dependent neuroprotective protein: A novel gene essential for brain formation. Brain Res Dev Brain Res. 2003;144(1):83-90. Abstact. Vulih-Shultzman I, Pinhasov A, Mandel S, et al. Activity-dependent neuroprotective protein snippet NAP reduces tau hyperphosphorylation and enhances learning in a novel transgenic mouse model. J Pharmacol Exp Ther. 2007;323(2):438-449. Abstract. Fombonne E. Three questions for Eric Fombonne. http://www.ohsu.edu/xd/education/schools/school-of-medicine/news-and-events/3Q_fombonne.cfm. Updated 2016. Accessed Jan 4, 2017. Gozes I, Van Dijck A, Hacohen-Kleiman G, Grigg I, Karmon G, Giladi E, Eger M, Gabet Y, Pasmanik-Chor M, Cappuyns E, Elpeleg O, Kooy R F & Bedrosian-Sermone S. Premature primary tooth eruption in cognitive motor-delayed ADNP-mutated children. Translational Psychiatry. 2017;7:e1043; doi:10.1038/tp.2017.27.